I recently was able to become a part of the "launch team" (i.e. 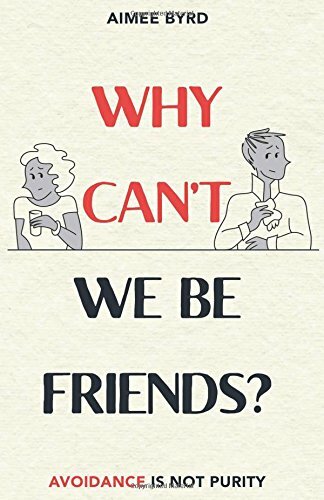 unpaid promotion tools) for Aimee Byrd's latest book Why Can't We Be Friends. One general premise of the book is that the church unwittingly has adopted secular perspectives on how men and women relate to each other and erred in discouraging cross-gender relationships. Our sexuality matters. Men and women together bear the image of God in humanity. That means we need to view our sisters and brothers holistically, not just physically. When we look at people as holistic, relational beings, we don’t reduce them to their bodies—specifically to their genitalia and sexual urges. Our femininity and masculinity are more than that. In Christ, male and female believers relate first and foremost to one another as "brother and sister." And while semblance to biological relationships can instruct us by way of analogy, in the church this is expanded because we are all being conformed into the image of Jesus Christ who "is not ashamed to call [us] brothers" (Heb. 2:11). And so within the body of Christ, the spiritual maturation of being conformed into the image of Christ knits together male and female relationships while working in both to preserve their holiness. This is not to deny our physicality and adopt some merely spiritual view of our relationships with one another. There are always temptations to resort back to the untruthful claims of our sinful nature and how we relate to one another. But we must—especially for believers— see male and female relationships more holistically and dynamically than mere physicality. The reduction of men and women to their mere carnal nature is to ignore that we are all made in God's image, were breathed into by the Spirit of God, and in the case of believers are being remade into the full, bodily image of our Lord Jesus Christ.